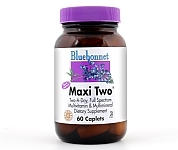 Bluebonnet’s Maxi Two® Formula is a higher potency, two-a-day, multivitamin and multimineral dietary supplement in a caplet and is formulated with highly efficient patented Albion® chelated minerals and popular carotenoids, such as natural beta-carotene and FloraGLO® lutein from 100% natural marigold extract. Directions: As a dietary supplement, take 2 caplets daily, preferably with meals, or as directed by a healthcare practitioner. Free Of: milk, egg, fish, crustacean shellfish, tree nuts, peanuts, wheat, yeast, gluten, barley, sodium and sugar.